is a pullout sofa, Cable TV with DVD player and WiFi. French doors in the living room lead outside to a fenced-in private patio. The patio has an umbrella table with six chairs and a there is a cushioned wrought iron lounge chair for sunbathing. You can't beat the location of this cottage. Our cozy Cottage is directly across the street from the beach! Across the street is the ocean! 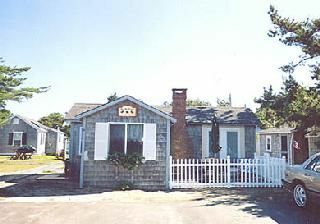 Sandys cozy cottage is directly across the street from the beach! Ocean view from the back yard! Your designated parking spot for Unit #4 is marked on the white pole directly in front of the cottage with a "4". Additional parking spots (first come first serve) are marked with the letter "R". The cottage is located directly across the street from Haigis Beach and is in an area convenient to restaurants, shops, and kids entertainment. No loading up cars or beach parking hassles...why? because you are already there. Cross the street and you are on the beach. You are truly just a few steps from the ocean. The cottage has its own parking spot and two guest spots if needed. Other outside amenities include: a private fenced-in patio, back yard with view of the ocean, BBQ-grill, picnic table and an outdoor shower. Inside amenities include: a fully equipped kitchen with microwave and coffemaker.The bathroom is roomy with a full size shower. In the bedroom there is a double bed. In the living room there is a pullout sofa that sleeps two, cable TV, VCR/DVD player and more. Fall asleep at night to the sound of the surf. Cottage was very clean, cozy, will rent it again in the future, will recommended to my friends. Quaint little cottage. Love the location! Cottage is neat, tidy and has everything a couple could want for a nice relaxing getaway. We are glad to hear you had a nice, relaxing vacation. The cottage is very cute and as everything you need. You can listen to the sound of the ocean while you sleep in the bedroom...it's very nice! The only downside is that there's no A/C, but only ceiling fans. The location is great, the beach is right across the street, no need to take the car. The water temperature was warm, the beach is beautiful and small but there were many seaweeds while we were there. The owners are nice and willing to answer all of my questions. Nice place to go! Positives: location, interior decor, good communication with the owner. Negatives: no A/C (definitely needed), smallish bed (not queen size), inefficient blinds in bedroom. Very close to the beach , needs air conditioner! But very well located!